The style and flair of your invitations suggests both your personalities as a couple and how formal/informal your wedding will be. It should convey if it will be cool and contemporary or classic and elegant or cultural and traditional or fun and quirky. Your format style and stationery should give a flavor of all this. Issuing wedding stationery in a timely and cost-efficient fashion is a logistical feat so here are some tips to help you: START AS SOON AS YOU ARE ENGAGED! The introduction to your wedding will be through the save-the-date correspondence and the actual hard copy of the wedding invitation. They are what make it real, they are the first announcements of your formal union as a couple and your forthcoming wedding. The style, theme and personal taste of you both through this stationery will be the first indication of how you view yourselves. Are you traditional? Is there a homage to your families and vintage style? Is your love story going to have a rustic theme or be totally quirky , wacky and new to celebrate how you both breakaway from tradition? Wedding invitations and save-the-date cards are the first public announcement of you as a couple. Later, there will be other stationery required such as ceremony and wedding programs, menus, place and table number cards which will continue on with the themes, motifs and style you set initially. Selecting your save-the-date and wedding invitation is really a commitment to the presentation of all your wedding stationery and the vibe your guests will be expecting. Deciding whether you would like a handcrafted feel with calligraphy or have printable graphically designed formats is one of the first decisions. The style, font, color palette, textures of the invitations will convey whether the event will be formal or casual, at a church or temple, a hotel or foreign destination. Save-the-date cards could be fridge magnets, flat cards, postcards, one photo, photo collage, a calendar, foil-stamped, letterpress or laser-cut. They should be both a memento and a respectful token of how much the presence of the guest would be appreciated. The wedding invitations should not really focus on registry information. That, along with the shower invitation, can be put on your wedding website. 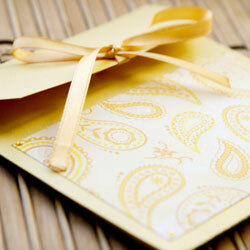 It saves space on your beautiful, artistic invitations for specifics such as venue and the wedding date. There is no need to mention children unless they are specifically being invited. The invitation should only address the guests you are actually inviting. Neither is it necessary to mention that it will be a dry bar or there will be limited alcohol. You can place any extra details about the event on the website nearer the time. The invitation itself should be elegant and concise, announcing what the event is truly about.